Follow an ancient river system. Swim in natural pools, fall asleep under the stars to the sounds of teeming birdlife and have all round-life-altering experience. The river systems of the Geographe are ancient, majestic bodies, with the Blackwood River and Collie River two of the biggest and best. The largest river in the South West at 28,100 square kilometres and 41 tributaries. Take a quiet walk along any of the many tracks and trails or sit still on the banks of the river and, in season, it’s quite likely you’ll see a marron too. Canoeing, Boating, swimming, camping and fishing are just some of the activities the river offers. Covers over 3000kms with 13 creeks and rivers flow into the Collie River. The local Noongar believe that the Collie River Valley is connected to Ngarngungudditj Walgu. This mythical snake-like being is said to have come from the northeast and created the Collie River, the hills of the Collie River Valley and the Leschenault inlet, before travelling back up the Collie River to rest in Minninup Pool. A perfect place to enjoy the Collie River is the Eaton Foreshore/Collie River Estuary – it’s local favourite location for fishing, kayaking and crabbing. The foreshore along the Collie River is an ideal picnic spot, with playground equipment for the children and lots of shady lawn areas. Along with great access to a wide variety of water activities, there is a well-used walk trail along the foreshore, which is perfect for a leisurely stroll and take in the scenic surroundings. Boat ramp facilities. 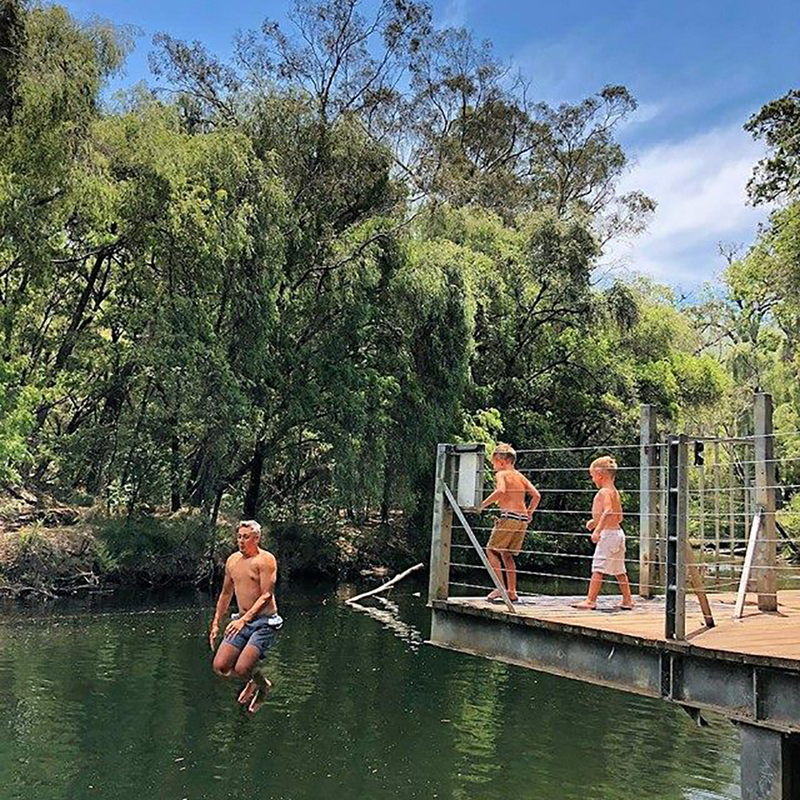 Within the Collie River is Honeymoon Pool, a wide natural pool surrounded by graceful peppermints, and Jarrah and Marri forest. Sunbake on the wooden platform or find your inner child and try out the swinging rope. Honeymoon Pool is thought to be named by WWII soldiers (it was a base camp for army training), who found several couples camped on their honeymoons. Find a friend to drop you upstream from Honeymoon Pool and then float down the beautiful Collie River. You may encounter some rocky parts - dependant on rainfall and dam releases - but that just adds to the fun. Be prepared to be invigorated - even in summer the water is cool and refreshing. Nearby Long Pool is also a favourite. Located only 3km south of Collie on Mungalup Road, this wide stretch of the Collie River is a beautiful and tranquil spot for swimming, fishing and canoeing. Take a picnic and relax on the grass under a shady tree. A beautiful location all year round, with winter's misty mornings making Minninup a popular spot for photographers. Picnic table and toilet facilities. The Capel River, the largest in the Geographe catchment, rises in the Darling Range near Mullalyup and flows via Capel, into the Indian Ocean at Peppermint Grove Beach. It was named after Capel Carter Brckman, daughter of early settler John Bussell. The Capel river has 6 tributaries; Capel River North, Capel River South, Gynudup Brook, Camp Gully, Layman Gully and Maidenhair Gully. Go canoeing up and down the Capel River from Mallokup Bridge – canoe up to the Capel Vale Winery (where you can have a sneaky wine) or down to the mouth of the river at Peppermint Grove Beach. 84 kilometres in length, the Preston River rises at Goonac Siding, near Balingup and ends in the Leschenault Estuary after passing through Donnybrook, Boyanup and Bunbury. The major tributaries the river include the Ferguson River and Joshua Creek. Minor tributaries include Thomson Brook, Crooked Brook, Charley Creek, Waterfall Gully, Mininup Brook, Millbrook and Gavin Gully. The Glen Mervyn Dam is along the Preston River. A popular winter (after rains) canoe or kayak is Boyanup to Bunbury. This is an interesting and scenic flat water paddle, about 26kms, with one small Grade 2 rapid at the back of the old Picton Super Works, close to Bunbury.